Festive fever has spread across Lowestoft as residents got into the Christmas spirit at the town’s switch-on on Saturday afternoon. Not even the weather or a temporary tree light failure could put a damper on the festivities which culminated in the big Christmas lights switch-on. 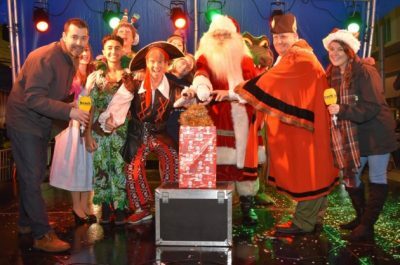 The lights in the town centre were switched on by the two elf on the shelf winners (pictured) who were also joined on stage by Mayor Ian Graham, Lowestoft’s favourite panto performer Terry Gleed, his co-stars and Father Christmas. Despite the town being beautifully lit up by the festive lights, a tree light failure meant crowds had to wait more than half an hour for the Christmas tree to shine bright. Amy Mullen, BID manager for Lowestoft vision said a “small technical issue” was the reason behind the failure. She said: “I want to thank everyone who turned up to the event and I hope everybody has had a great time. Before the switch-on crowds were entertained by live music hosted by The Beach radio station. There were festive performances from Ormiston Denes Academy, Cantors Theatre School and guitarist Baden Aldridge. Visitors were also able to get their festive shopping fix as shops stayed open until 6pm. Mayor Ian Graham described the event as a “brilliant start to Christmas”. He said: “It has been a really great event despite the weather. We have had a great crowd who all seem to have enjoyed themselves. Attention now turns to the town’s Marina Theatre where a number of fantastic shows will hit the stage. These include the Sensational 60s Experience and Peter Pan. Posted in Academy news on 1st December 2018.